Without thinking twice about it, Jason Flatt reached over the fence and started petting the pit bulls. “And people call this a vicious breed,” he said with a smile. Flatt and his friend Ami Ciontos had invited me along as they visited homes to promote spay/neuter in an inner-city Atlanta neighborhood. The two are already well known in rescue circles around town, and now they are joining forces to combat pit bull overpopulation through their new organization, Tails in the Hood. 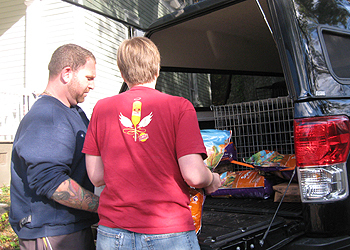 After loading Flatt’s truck with bags of dog food generously donated by Halo Pets (Ellen Degeneres’s pet food company), along with vaccines and other supplies, we headed over to Jermaine’s house. Jermaine was caring for a distant relative’s pits as well as his own – five dogs in total. Flatt and Ciontos gave him two bags of Halo dog food and started talking with him about how spay/neutering his pets might help out with some aggression issues he’d been having in the home. Flatt and Ciontos spend most of their time teaching pet owners in the inner city about the importance of spaying and neutering, or “speutering,” their pets. After chatting for a few minutes with Jermaine, Ciontos told him about a free service they had lined up through Lifeline Animal Project, and that she would be happy to pick up his dogs and take them there. Later, she explained to me that Lifeline provides these services at a significant discount, and donations to Tails in the Hood fund them. 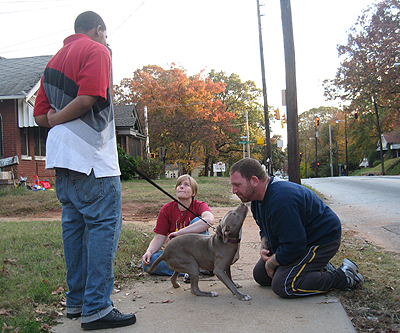 We drove up the street to visit Kevin, a young man Flatt and Ciontos had met a week earlier at the Atlanta Pit Bully Rally that Ciontos hosts each year. When they first met, Kevin had what he thought was a pregnant blue pit puppy in his yard, and Flatt and Ciontos were interested in helping him take care of her and the babies. As we drove along, we spotted Kevin out walking the pup he had named Lady. She must not be pregnant after all. Flatt pulled the truck over and parked in the street. He and Ciontos got out and started playing with Lady right there on the sidewalk, the whole time talking with Kevin about the importance of having her spayed. Kevin finally agreed, and Flatt gave him two bags of Halo dog food and a “Friends to the Forlorn” T-shirt. After hanging out with Kevin and Lady for a while, we left for the east side of Metro Atlanta. One of Flatt’s friends had contacted him about some neighborhood kids running pit bulls with car tires attached to their necks in their yard, and she thought they might be up to no good. It’s all about the approach. If you come out and criticize, you will just turn people off. 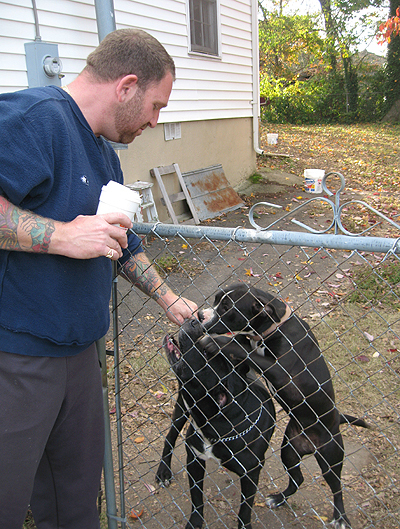 We pulled up at the address and met GK and Pic, a pair of young men with three pits in the backyard. Flatt asked them if they were interested in selling the dogs, and GK responded that they would be soon. Flatt and Ciontos started playing with the dogs and found out that their new friends wanted to start a kennel and breed weight-pulling dogs. They thought they would be able to sell pit puppies for big money until Flatt and Ciontos told them about all the pits they had to rescue from the pound for that very same reason. Flatt talked GK and Pic into going out for lunch with him and then visiting the pound to see all of the pit bulls slated to be killed the following week. For more information about Tails in the Hood, please e-mail Jason Flatt. Donations are most welcome at his website, Friends to the Forlorn, which is sponsoring Tails in the Hood. Thanks for your comments and we agree! 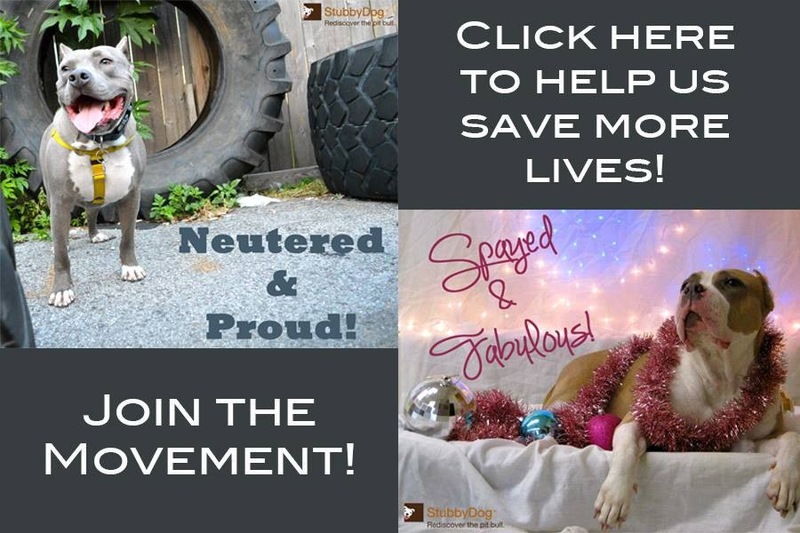 Together we can help pit bulls in both big ways and small.